Set is nice looking, not as well built as I was expecting. Two chairs were damaged when we received it, one was cracked at an attach point, the other had a broken slat on the chair back. Overstock sent replacements right away, and so far so good. we have used them a couple of times and have gotten compliments on how nice our set looks. 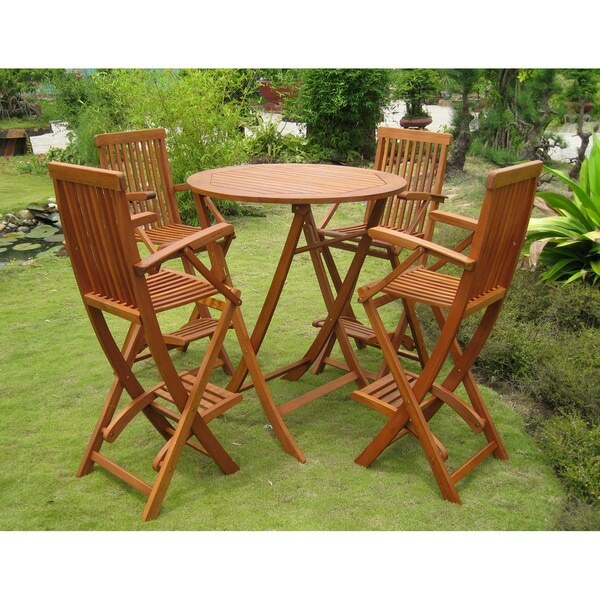 This item is made from Balau Hardwood which is rated similar in strength and durability to Teak Hardwood. Balau Hardwood is an excellent wood for use in Patio Furniture due to its high density and naturally oil rich composition both of which contribute to the longevity and durability of products made with this Hardwood. Add of touch of style to your outdoor spaces with the Royal Tahiti 'Seville' bar-height dining set. The folding set includes a 43-inch high table and four bar-height chairs, and is made from environmentally sustainable solid hardwood. Dimensions 37.0 In. X 6.0 In. X 49.0 In. The set looks great and the table is fine; however unless you wish to just look at the chairs, which are nice looking chairs, there is a problem. The chairs are horrible constructed and not stable. The seat actually starting coming undone within the first few weeks. We cannot use the chairs due to the poor construction. This is a nice looking outdoor furniture set, but once you actually sit in a chair, the obvious lack of quality is clear. It is more than lack of quality; it is poor construction. Thank you. Really pretty set and the fold-able feature for both table and chairs is a plus. The only negative is the table is not as stable and steady as we would have liked. Great patio set; chair's seat width could have been wider; I may not have read description carefully, but I still fit! Nice finish on the set. Strong chairs! Front of chair broke 4 months after purchase, just leaning over to pick something up off ground while holding onto armrest without even sitting in chair. Flimsy is an understatement. "Should the oil be applied the first year? Prior to placing outside in the sun?" Hello mpcdavis, it is recommended that you apply the oil at the beginning of the season and at the end of the season. "Does the Table Fold? How could I get the folding chairs?" Yes, the table folds. The set comes with folding chairs. "There are two different chairs in the pictures. One is folding and the other is not. Which chair comes with this set?" It comes with the non-folding chairs. "What is the height of the seating portion?" The seat height is 30 inches.